MEI is an HP Authorized Support Partner for Designjet printers. 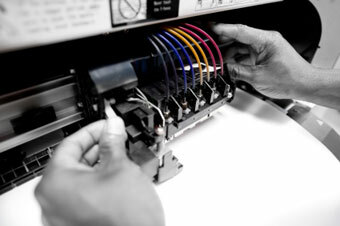 MEI is the leading HP Designjet printer repair center located in the heart of the DC Metro Area. Our certified technicians can perform warranty and non-warranty repair and maintenance on your printers in an efficient and accurate manner. You don't need to contact HP to schedule a service call or find a service center. Contact MEI directly to receive personal service by a local technician and the expertise of an HP repair specialist. Through MEI, scheduling and repairs can be done in an expedient, convenient fashion. With an HP extended warranty purchased through MEI, we perform the services and HP provides the parts. And, if you've purchased a warranty directly from HP, MEI can repair your equipment according to the terms of your agreement. When you encounter difficulties with your HP Designjet printer, please contact MEI immediately. It is very important that your equipment function properly to minimize downtime and increase productivity. The first step in our repair process is for our HP certified technicians to troubleshoot the problem over the phone. We understand how important it is to have your printer up and running and this is the most expedient method. If an on-site visit is required following the phone consultation, we will schedule an appointment for late day or next day service. Our technicians are in the field with a full inventory of replacement parts ready to respond to your repair needs. Remember, we are a locally owned business so we are always close at hand. For customers who want peace of mind when it comes to their large format printers, we offer service agreements, maintenance contracts and extended warranties. The terms of each agreement (duration of each contract and coverage of parts and labor) can be varied to meet your needs. Contact us to discuss a plan tailored to your business. HP service contracts can also be purchased through MEI, as an extended warranty or annually. MEI will be the first point of contact, without the need to go through the HP call center and escalation process. Let MEI provide you with fast service from a technician who knows and understands your work environment. We pride ourselves on providing individualized attention for your product and service needs. © 2019 Manesh Electronics Inc. Page last updated: September 11, 2016. Code by Brundage Web Design.